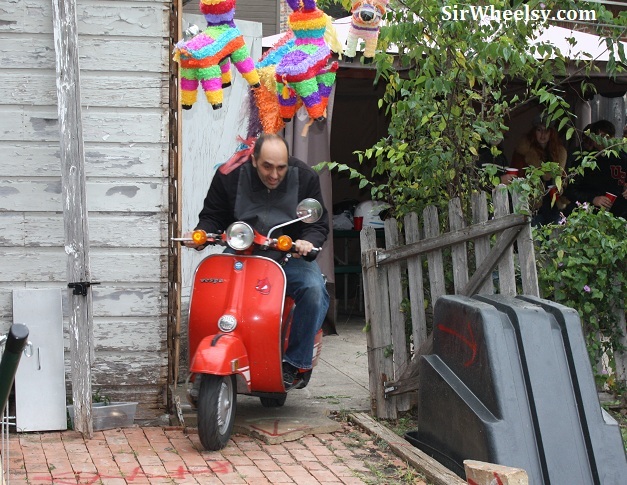 The first weekend in October was the annual Dallas Classic Scooter Rally, and on Sunday afternoon a few hungover folks stuck around for the gymkhana. A gymkhana is a kind of scooter or motorized-vehicle obstacle course, if your not familiar. With no limitations on course layout, the design tests rider skill and mettle. A crazy course design usually means an increase in crashes, laughs, and overall crowd enjoyment. We had some excellent runs and I wish I had more video of scooters crashing into the side of the garage. .
First up, we have the Rocker on a vintage Suzuki dirtbike. Our friend on the motorcycle gets a bad deal on this post because his awesome crash happened to be the only motorcycle running the course (and dumbass is referring to the sign on the door).